A passion of ours is the creation of a truly unique and memorable wedding day which reflects the personality of the couple. No two weddings are alike, although similar requests often reflect international trends, whilst the backdrop of the Algarve often inspires a certain ‘look’ in some of our countryside or sea-view properties. Whatever the setting, our couples are looking for a lack of fuss but a show of elegance: the ‘wow’ factor without the extravagance but with the food, wine and atmosphere consistently mentioned as the best their guests will ever have experienced. We take our role very seriously, but offer a laid back, intimate, private and personal day with a guaranteed lifetime of memories. Our two couples below arrived with very different briefs. One was very boho, with a colour pop: the flowers were bright and scattered as individual blooms, and the tables were adorned with painted tree sculptures with family pictures hanging from the branches - a very personal, quirky and utterly delightful tablescape. The gust tables were scattered, with different choices of layout: some rectangular, some circular making for a garden party feel. The second wedding was very natural with a sense of nature derived from the villa’s gardens: plaited olive and greenery, interspersed with touches of white. 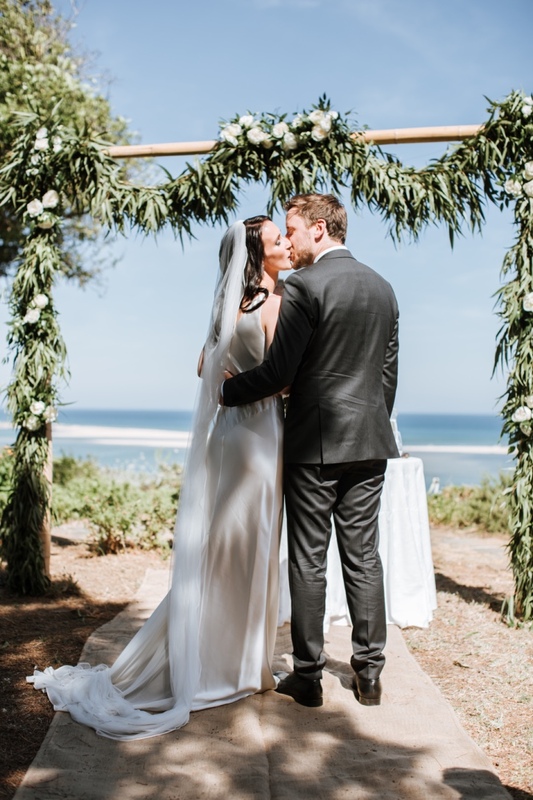 The ceremony arch was a free-flow structure with driftwood, framed in natural Algarvian fauna, so that the spectacular ocean-view location was the centre of attention. The tables were positioned in an olive grove courtyard with a top and three sprigs. Both styles came together as a result of the couples’ individual requirements, our own experience, and design briefings with the florist. We find most of our couples have a really strong idea of what they want and we see it as our job to interpret this and make it happen. We are not precious planners who know better: we just know how to make it happen in the Algarve! Your choice of photographer is also a reflection of your style, and the two examples above are by two different photographers, as they each individually matched the couples’ desire for specific memories. Long after the confetti has blown away, the photos and videos offer a lasting reminder of the day, and need to capture the style and thought that went into all the planning. These two images perfectly represent the couples and the ‘look’ they were after. From set-up to ceremony, welcome drinks to dinner, cake-cutting to dancing, the wedding day for us is a procession of perfection. We set the stage and watch as you and your guests add life and joy, making all the hard work, the planning, the emails, the meetings, the tastings come to life and give you the day you dreamed about. Our aim is to offer total satisfaction to you, your family and friends as we all unite to bring together the start of a new chapter for all our couples. It’s the best feeling in the whole world!